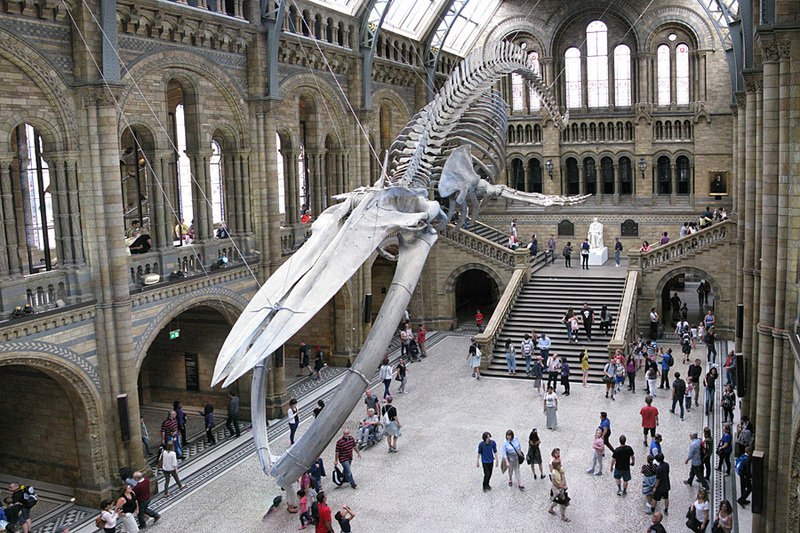 The Natural History Museum in London has reopened its main hall after closure for a makeover, and centre stage now goes to the blue whale skeleton, suspended high above the visitors, in a diving position. I paid a visit on the first day and was very impressed. I’ll admit I was a little disappointed when they announced Dippy the dinosaur was to end its stay there, but the new resident of Hintze Hall dominates and fills the space even more effectively. It’s sheer bulk and central overhead position create a dramatic statement never before experienced in the museum’s main hall. My favourite viewing position is probably the balcony – here you get the closest view and can appreciate it’s true size, including the jawbone – the largest bone in the animal world. The museum have chosen the name Hope for their new star exhibit (though I suspect the name won’t quite capture the public imagination in the same way as ‘Dippy’), and it symbolises the way we must look after the natural world which we live in and are part of. During the hunting era the blue whale came close to extinction, but since the ban in 1966 things are looking much brighter. The population is still small compared to what is was, but it seems to be rising every year. The exhibits around the edges of Hinzte Hall have also been changed. There are ten bays on the ground floor – five have displays representing various stages in the history of evolution, and five have examples of current life. 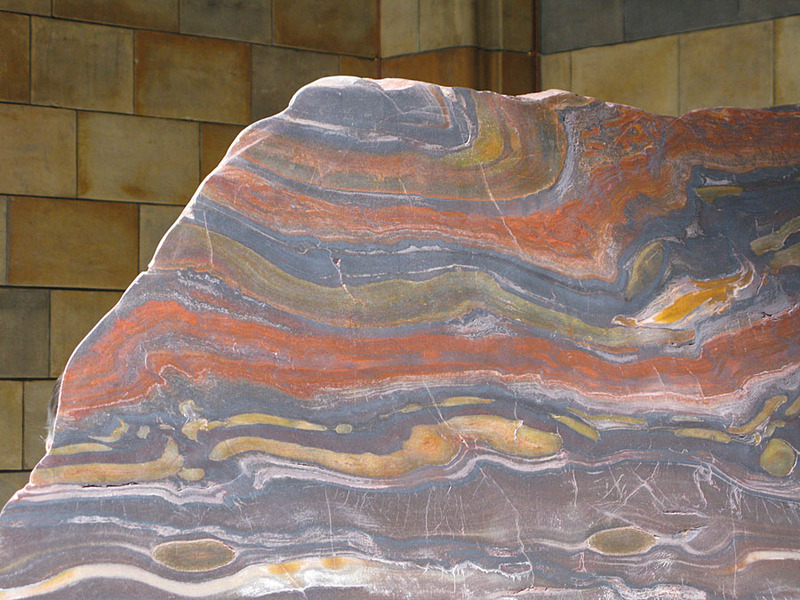 A beautiful section of rock shows some highly colourful banded iron formations. These were created over 2 billion years ago when the first photosynthetic organisms began to oxygenate the atmosphere. There was plenty of dissolved iron around at that time and so iron oxides were created – effectively the world rusted, and created some beautifully coloured rocks. Once all the free iron was used up such an event was never to happen again. 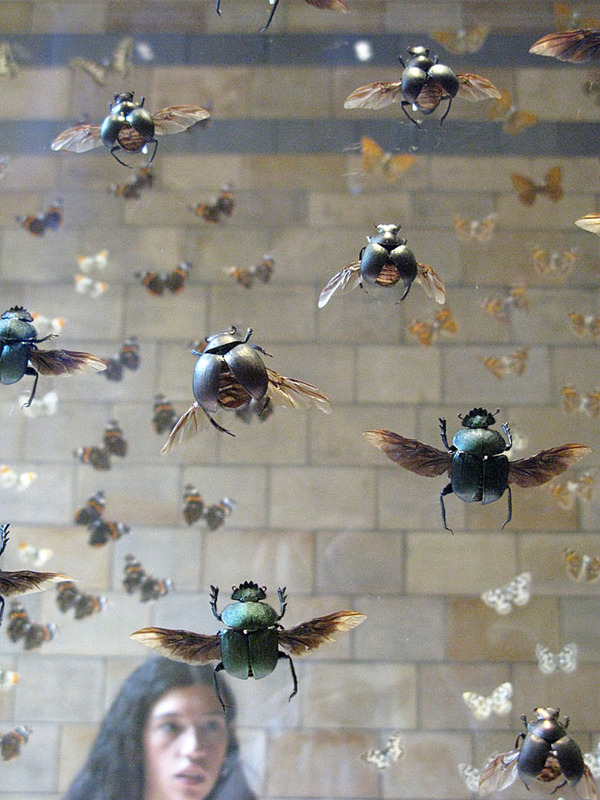 I think my favourite new exhibit is the cabinet of insects. 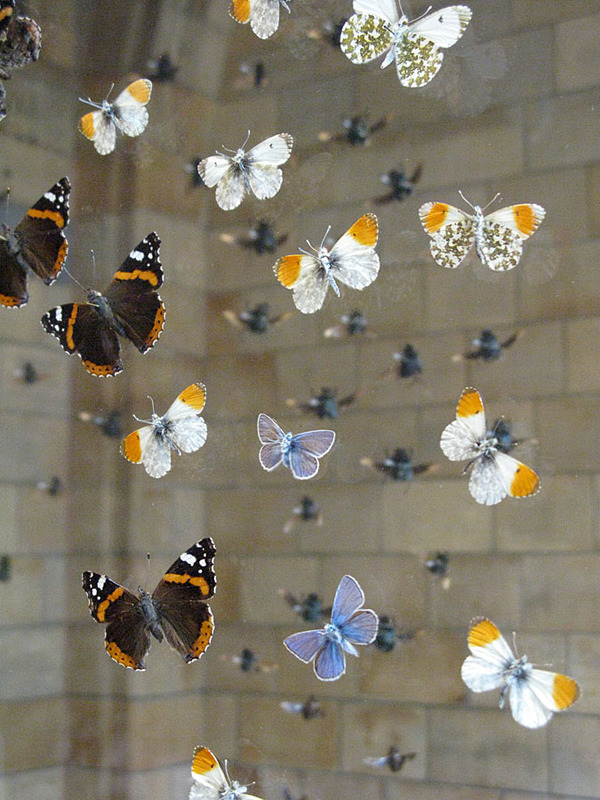 This is an all glass case with insects of various groups stuck onto glass panes, giving a wonderful impression that they are all flying up towards the roof. 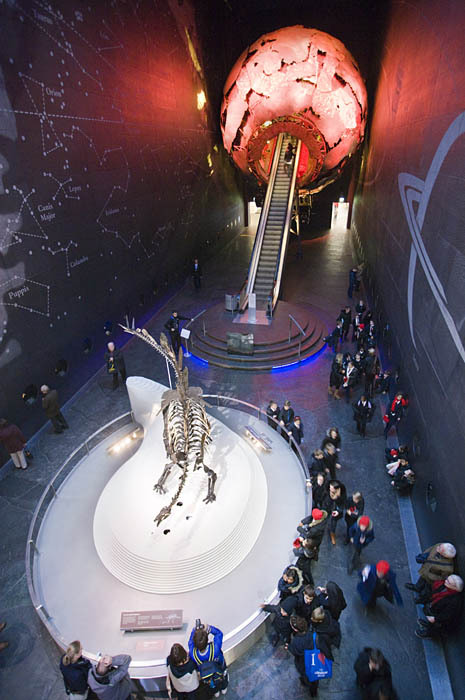 There’s an exciting buzz at the Natural History Museum in London – a new dinosaur has gone on display, the first for a 100 years. 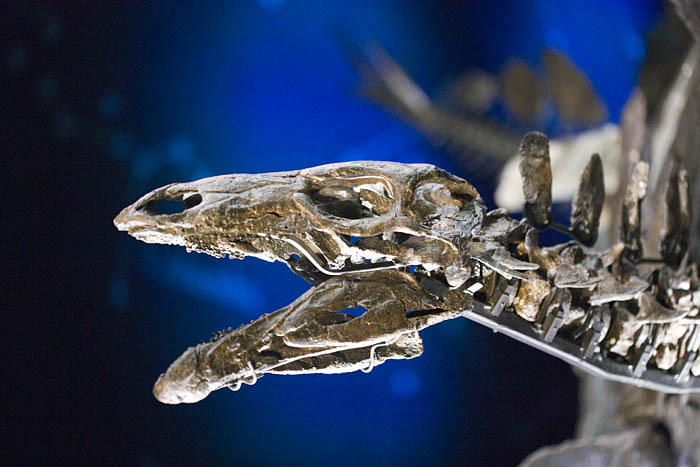 It certainly is something quite special, partly because of it’s near perfect preservation, but also because it’s the genuine fossil on display rather than a cast, and it’s not behind glass – you really can get up close and personal. She’s a Stegosaurus and she’s been named Sophie, after the daughter of the main donor that made her acquisition possible, even though the museum scientists actually have no means of knowing if she really was female. But perhaps it’s appropriate – someone did comment that she looked very small and cute and maybe should be carrying a little designer handbag. In fact, the reason she’s small is that she died at quite a young age and was not at all fully grown, but at 5.6m (18 foot) she’s still impressive enough. 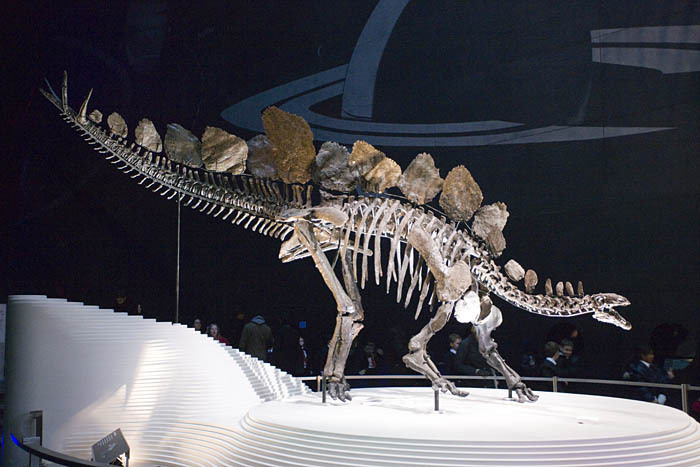 Her full title is Stegosaurus stenops and she’s the best preserved of only six known fossils worldwide. Stegosaurus existed around 150 million years ago, right in the heart of the dinosaur era. This fossil was found in Wyoming in 2003 and it took 18 months to carefully dig it from the rock without damaging it. The museum acquired it a year ago and has since been carefully scanning and photographing it for research purposes. They hope to discover the reason it had the huge plates running along the back and tail – were they for display or heat control? Also it’s a bit of a mystery how an animal with such a small head and jaws managed to eat enough to grow so large. The museum has done a superb job with displaying Sophie on a beautifully sculpted plinth in the Earth Hall and you can view up close from ground level as well as from an overhead balcony. Exciting times at the museum – maybe more new exhibits are in the pipeline. 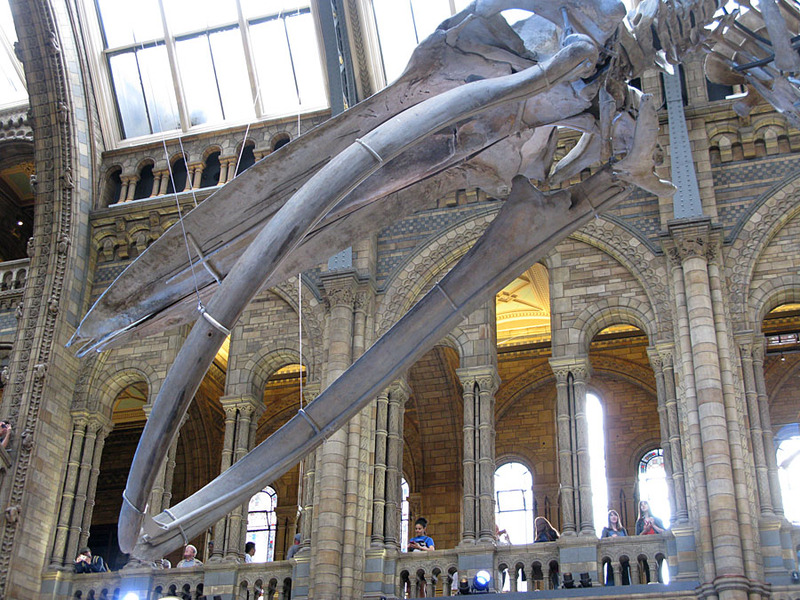 Not much to say here really, just a bit of a plug for the Natural History Museum in London. 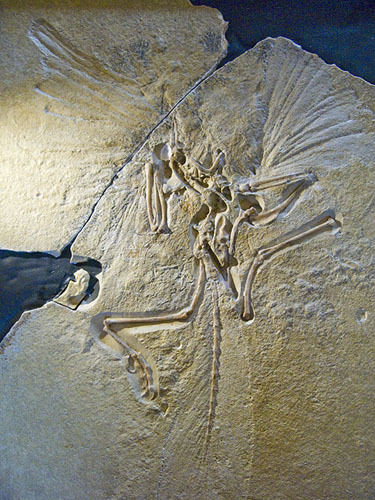 One of it’s most treasured displays is the very first Archaeopteryx fossil which was found in Germany in 1861, giving Darwin and Wallace some timely evidence for their newly published theory. And they show the genuine fossil, not a cast. I think I love the building nearly as much as the exhibits. Inside and out, everywhere you look, there are carvings of creatures weird and wonderful. 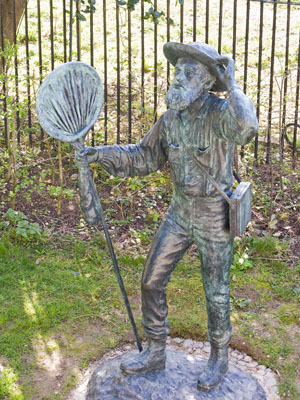 Alfred Russel Wallace (1823-1913) certainly doesn’t deserve to be forgotten. He came up with an identical theory for the mechanism of evolution at the same time as Darwin, but how many people now would know his name? Fortunately things are changing a little and he is being brought out of the shadows to take his place in history once again. This is largely down to the work of George Beccaloni of the Natural History Museum, London who has been campaigning to give him the credit he is due. The campaign was given a huge boost by comedian Bill Bailey’s programmes on the BBC last year when he retraced Wallace’s steps in the jungles of Borneo. 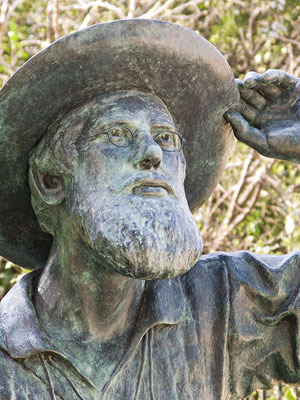 Wallace was a dedicated and adventurous naturalist and spent his life studying the distribution of life around the globe and attempting to unravel the mysteries of evolution. He had two major trips to collect and study wildlife. The first was a four year exploration of the Amazon Basin. Unlike Darwin, he was not from a wealthy privileged background so needed to generate funds for himself and he did this by selling samples that he collected. The South American trip was a great success, but soon after they sailed for home a fire broke out in the ship and it was sunk. Luckily all on board were saved in the life boats, but a large part of Wallace’s samples and notes from the trip was lost. His other major exploration was an eight year trip to the Malay Archipelago. It was during this trip in 1858 that his theory on evolution suddenly came to him – apparently when he was laid up in bed with a fever. He wrote up his ideas in a paper and sent it to Darwin back in Britain to see what he thought, asking him to pass it on to the eminent geologist Charles Lyell if he felt it was worthy. In Wallace’s absence, they decided to present the paper, along with some of Darwin’s writing on the same subject, at a meeting of the Linnean Society in London. Initially there was not a huge amount of interest, but Darwin was now spurred on. He had been developing his own ideas for some years but had been reluctant to publish, wishing to amass as much evidence as possible for what he knew would be a controversial theory. But now the cat was out of the bag, so to speak, and he rushed out his first edition of The Origin of Species the following year. Wallace and Darwin deserve equal credit for natural selection in my view. Wallace was a modest man from a modest background and perhaps that is largely why he has become sidelined in history – but it’s good to see him getting a little of the limelight once again. 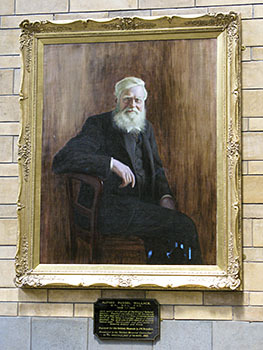 A painting of him was donated to the Natural History Museum in 1923 and displayed on the stairs at the head of the Central Hall, but it was removed in 1971. Last year it was restored to the same position and it was unveiled by Bill Bailey. The Museum is also home to an ongoing project to digitise and make available online approximately 5000 letters to and from Wallace. We now also have for the very first time a statue of Wallace. His grandson gave a speech at it’s unveiling at the Natural History Museum, which was performed by David Attenborough. Wow, he was certainly a dedicated and enthusiastic naturalist.